In 1942/43, Stambridge School had 52 children. 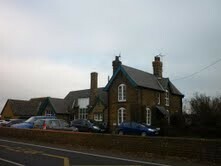 There were 2 classrooms and 2 teachers, one of whom was Miss Jeffries, the headmistress. She lived in a house attached to the school. The other teacher was Miss Norton. My mum helped cook the school dinners, and on occasion she cooked them in her own kitchen. There was an air-raid shelter in the school grounds, which we often used. The earth toilet was situated at the end of the playground. The children planted a horse chestnut tree to celebrate the end of the war. Were you a pupil at Stambridge School? Why not share your memories? Either register as a contributor or contact us directly. I found your excellent website while researching my family history. All my antecedents come from Norfolk, but my dad was sent to work at E K Cole during the war. I was born in 1950 and we were then living in Manners Way, near the airport but moved to Stambridge in 1955. I remember with great fondness, my days at Stambridge Primary School - even though Miss Jeffries tried (but failed, thanks to my parents' intervention) to prevent me writing with my left hand by holding it firmly behind my back! Mrs Bright was my first teacher and she was wonderful. After Miss Jeffries retired Mr Page became headmaster. I recently looked at our house on Google Streetscape and was amazed to see that the owners still have my dad's crazing paving in the front garden and the original wrought iron gate. Things were made to last in those days! A very nostalgic trip for me, which has sparked lots of memories. Thank you very much!